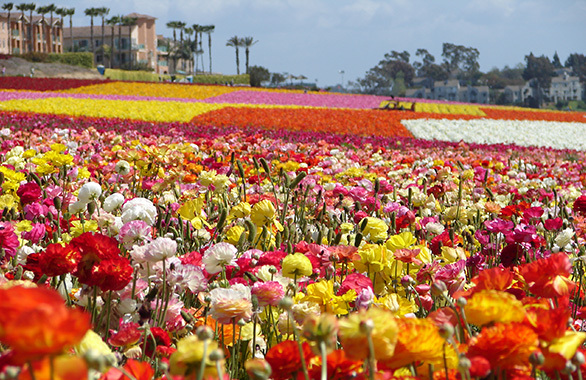 Each spring, Carlsbad, California residents and tourists flock to the city’s Flower Fields to enjoy a brilliant display of Giant Tecolote Ranunculus. The colorful show lasts about six to eight weeks, typically beginning in March. Carlsbad Ranch is the spot where nature comes alive with flowers so stunning in shades, and in arrangement, that they often have the eyes of passers by on nearby streets and highways affixed at the gloriousness of it all. The flowers are strewn in the ground, in rows and patterns that look perfectly tidy from afar, but up close show that nature is simply having its playful and whimsical way with us. The ranunculus are surely the stars of the Carlsbad Flower Field show, bursting with orange, white, pink, and yellow that is sometimes monochromatic and often sprinkled together like ice cream toppings or flowers in a Monet garden painting. In addition to the ranunculus display, the Flower Fields at Carlsbad Ranch offer a miniature rose garden and the All-American Rose walk of fame that holds 170 of the All-American Rose selection winners chosen since 1940. The Flower Fields is a perfect spot for holding birthday parties and other event such as weddings and corporate gatherings. There’s a newly built barn on the property that can house up to 200 people, and nearly every inch of the Fields and barn affords striking views of the Pacific Ocean. Entry to the Flower Fields, where you can view the flowers up close, is approximately $14 for adults, $13 for seniors (60 years of age and up), $7 for children (ages three to 10), and free for kids less than two years of age. Season passes are available for all age groups. To learn more about the Flower Fields, we suggest you visit the Carlsbad Ranch Flower Fields website.